If you are a data hoarder and ever frequently subreddits such as /r/datahoarder or /r/homelab it seems like the only two drive brands people buy are Western Digital for the reliability, or Seagate because they are cheap. However, there is a third option worth going for, and that is Toshiba. They do the usual drive options including the desktop focussed X300, enterprise drives, and the NAS orientated N300 which I am reviewing today. The N300 is well worth your consideration, as it is both the cheapest per TB and has positive results from Backblaze. Backblaze are cloud storage provides that are famous for their reliability stats, which most people use when saying Seagate are rubbish (due to one bad model years ago). 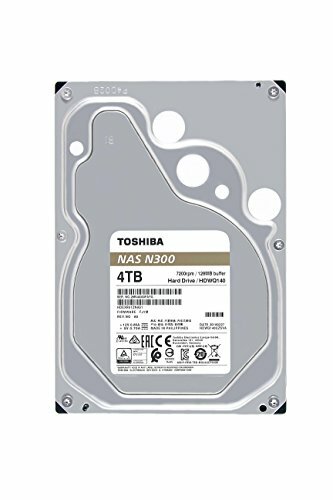 Looking at the NAS options on Scan you can get the 4TB Toshiba N300 for £101.48 with the next cheapest being 4TB Seagate IronWolf NAS at £106.99. If you want the popular WD Red that will set you back £119.99. Both the Seagate and WD run at 5400RPM vs 7200RPM of the Toshiba, not that it will make a huge difference for a NAS. The N300 comes in options up to 10TB which costs £281.99 with the next 10TB model being the Seagate IronWolf at £298.49, so quite a big saving if you plan to populate a large NAS. 12TB and 14TB models should be hitting the market soon. The Backblaze figures for 2018 showed positive results for Toshiba. In Q4 they added 1,200 Toshiba 14 TB drives (model: MG07ACA14TA) helium-filled PMR (perpendicular magnetic recording) drives which suffer a 3% failure rate. This looks high, but it is similar to the other new models and should drop over time. The older drives, even though there are not many of them had a 0.69% and 0% failure rate. These drives, of course, are used in datacentres with 24/7 heavy use and will not represent the usage scenario for the vast majority of consumers. In terms of specification, this is relatively standard as far as hard drives go. The N300 uses a Serial ATA 3.0 or SATA 6Gb/s interface in the 3.5″ form factor. Sustained data transfer sits at 200 MB/s for the 4TB model, 210 MB/s for the 6TB, and 240 MB/s for the 8TB. The entire range is rated at 180TB/year workload which should be more than adequate for consumers. The drive can support multi-RAID systems with up to 8 hard disk drives, allows large volumes of data to be reliably stored and accessed by multiple clients 24 hours a day, 365 days a year. One of the things that makes this different from a desktop drive is the integrated RV sensors which detects vibrations caused by large array systems. The N300 drives ensure high reliability by minimising vibration effects through their advanced control and sensing technology. Multiple sensors detect the slightest shock and built-in RV sensors also compensate for rotational vibration – eliminating the possibility of ‘knock-on' vibration in multi-bay NAS configuration systems. My sample drive arrived in retail packaging, this is important as if you buy it from the likes of Amazon, they have been known to package hard drives very poorly. With this, the contents came padded in a specially shaped air filled packaging, so it should be able to take a knock or two in a delivery van. Most of my tests were carried out within my main PC then transferred to the NAS later (a self-built Ubuntu server in my case). With the drive speed rated at 200MB/s it should max out a network connection. Using CrystalDiskMark I was able to achieve the rated speed for both read and write, with the usual large drop off once you move over to small file read and writes. The performance is matched in ATTO Disk Benchmark and here we can see that the read speeds peak at the 4KB read size while write is somewhere between 32KB and 128KB. Network files transfer speeds were as expected, with the server connected to my PC via the Zyxel GS1920 gigabit switch it was my network speeds that were what limiting the file transfer speed, with it easily hitting over 110MB/s for both read and write. Transferring small files was as expected much slower with an images folder with files from 2kb to 100kb transferring at around 2.5 to 3MB/s read or 1MB/s write. During my use, I didn’t find the drive to be particularly noisy either if anything it was less noisy than the old WD green I have in my main PC as additional storage. For me, noise is not a concern as I keep my server in a separate room. There is nothing to fault about the N300 as far as I am concerned. I haven’t reviewed the competing brands, but for my personal consumer needs it does everything I want it to and does it at a lower price point than others. The Backblaze data gives me confidence in Toshiba as a brand, and if you have some common sense, you will be backing up important data off-site and running RAID to help with redundancy. The lowest priced per TB NAS drive on the market, with good reliability and performance. NextQualcomm Snapdragon 712 vs Snapdragon 710 – How does the new chip improve from last year?